CENTRAL IMAGE: This large photo represents my interest in succulents, still life photography and Mexican folk art and Halloween. >> MARIGOLD GARLAND: Known as “flowers of the dead”, they can be formed into garland chains or arches for altars. The Aztecs called them cempazuchitl. >> PAPEL PICADO BANNER: Literally “cut paper” in Spanish, these colorful tissue paper decorations ingeniously incorporate entire scenes and words. >> PERSONAL PHOTOS: Altars often have as their focal point a large photo of the deceased; since I’m still here I chose several faves from my past. They include a b/w photo of me as a toddler, me in my Freddie Prinze phase, me mugging in a photo booth, me now. The photo in the tin heart frame at top is a very young Paul vacationing in Mexico; note the hat. >> DISCO BALL: Representative of my all-time favorite musical genre, the reason I dropped out of college and what I expect my altar’s soundtrack will be. >> EX VOTO: A small metal charm to a saint in gratitude or devotion; I chose this golden boy because I thought it perfectly represented me as a child. >> CHAMPAGNE: It’s typical for the deceased’s favorite tipple to be provided for them; in my case it’s Veuve Clicquot Champagne. I respectfully offer that I can make better use of it while alive. >> CANDLES: Handy for the deceased looking for their altar in the dark. Plus I couldn’t resist using my little barrel cactus votives. >> FRUIT (AND VEGETABLES): Anything seasonal is acceptable, but I decided to add chiles, tomatillos and pumpkins. Not only do their colors look great together but they’d make a great soup. >> SALT: Symbolizes the continuance of life. >> THAT HEART: Symbolizes my ongoing serious health problems, which began with a quintuple bypass in 2004. >> GLASS OF WATER: A thirst-quencher for traveling souls. >> FAVORITE FOOD: I chose corn meal because so many of my favorites are corn-based: corn chips, corn bread, corn pudding, masa, tortillas, the list is endless, really. >> REPRESENTATIVE ITEMS: As an artist I chose a few of my most-used paintbrushes. >> FAVORITE ITEMS: I pared down the truckload to two little kitsch figurines from the 1960’s, one a devil, the other a voodoo doll. When their heads are pushed down an acerbic saying is revealed. Hilarious! >> SKULLS: In Mexico, sugar skulls emblazoned with the name of a loved one are placed on the altar. Previous sugary craniums caused a plague of ants so these are painted ceramic and glitter. >> LOS ANGELES TIMES: I spent the most years of my professional life there. >> OTHER ITEMS: Copal incense, bread (pan de muerto), baskets, images of saints and even toiletries, can typically be found on an altar. ¡ F E L I Z D I A D E L O S M U E R T O S ! Veuve cliquot! Nice! I feel like I probably don’t appreciate disco enough…any suggestions? Yes! That’s a much nobler purpose for Goldie … Miss you and The Mister, too! Nice ‘stache! Also, how about a nod to Arizona and all the great people you met there? I’m just teasing. Your display is fantastic! OMG!!! I love this! how sweet. 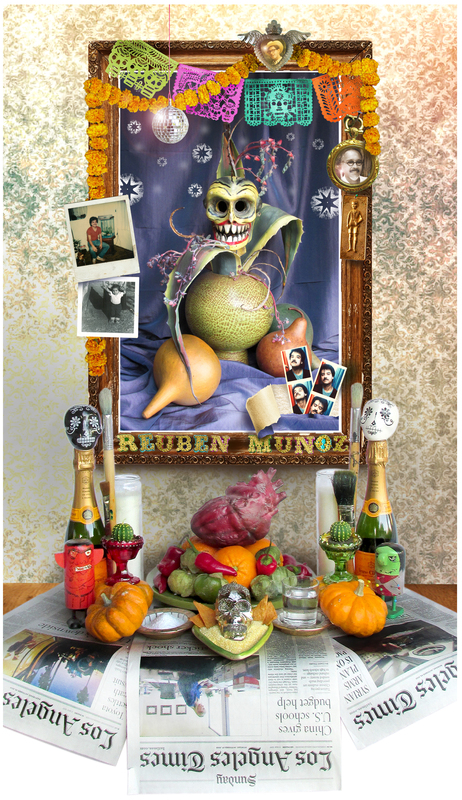 Reuben, you’ve done it again………such a beautiful altar! If you don’t already know….Saturday, Nov. 2 is the Santa Ana Dead of Day Celebration..downtown, Main St & Birch St..1-10pm (I think) fabulous…..the altars at night in an area with no lighting is magnificent…moved me to tears last year….pretty crowded…..kisses to you. You’re sweet, thanks for the tip, Guida … I’ve heard tell that the Day of the Dead event in Santa Ana is pretty awesome! The “Freddie Prinz” photo is the most awesome!! Quite the display. But I just can’t decide which part I like most. So will say that each part makes me think of the different parts of my life. And that’s kinda scary cause my life has had such wild swings in direction. Oh well, I’ve survived. And found friends and laughter along the way. OK, now someone has finally shown me the potential for celebrating Oct. 31. You’ve put in the personal and exorcised the commercial — that’s some powerful magic, Reuben. Love it. Thanks, Denise, I enjoyed putting it together. I think the end result has magic, too! Hi Reuben… So it’s not all about candy,LOL!!! That is quite special. I never understood the meaning of Dia de los Muertos except for All Souls day from catholic school. Your explanation is enlightening. You do have a way of putting things together with meaning. Thanks, Val, I appreciate your comment so much!